John Bonner is sure that anytime now he will recover from the sting of his recent separation from his wife. And he’s begun to wonder if he truly wants to spend the rest of his days running the family scrap-metal business, an operation where his employees are likely to have made the very license plates they now shred. His sister, Octavia, has just returned to Ohio from Boston to nurture the pain of her own broken relationship, and she is more certain: Following in the footsteps of their imperious father is a recipe for emotional disaster. But then two of John’s more eccentric workmen discover thousands of dollars stashed in the trunk of a car, the remains of a drug deal gone bad. The question of what to do with this unexpected cash draws John and his sister into the lives of their newfound collaborators, and sends them all on a surprising journey of high jinx and the heart. 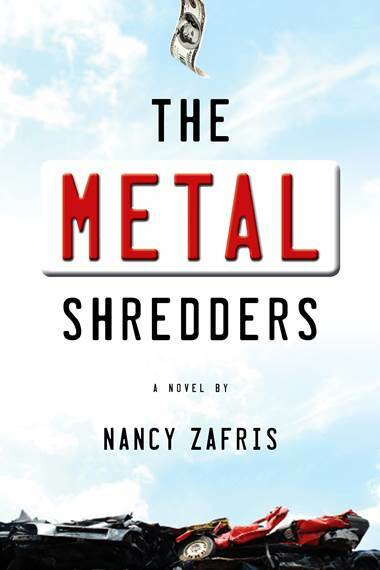 In The Metal Shredders, Nancy Zafris offers up a refreshingly wise, offbeat, and thoroughly convincing look at blue-collar America. Hers is a world rich in humor, steeped in closely held traditions, and filled with gently endearing, slightly crazed characters trying to discover just who they are. In the process they discover much about love, loyalty, family obligation, class—and yes, scrap. In the farthest corner of the Shredder yard sits a late-model LTD with 51,000 miles on it. It should be slated for shredding, but it’s not. It’s going to get a beauty makeover instead. John tries to explain why to Octavia, but it’s hard to come up with a reason since there is none — at least no reason that makes sense. The car runs, but it isn’t drivable. A discouraging odor has seen to that. Which is how the Senior referred to this death bouquet: a discouraging odor. A challenge, he offered with the meagerest of fist pumps. The Senior even skimps on fist pumps. The smell is more than challenging. It’s overwhelming. For three long summer weeks two murdered bodies lingered undiscovered in that car and they’ve left an eternal afterlife. It’s completely upsetting the way a smell that you’ve never smelled before can awaken some part of your brain that instantly remembers it. John is worried about the effect it might have on his employees. What startling behaviors will result from their false recovered memories awakened by this smell? Whether or not Octavia can make it here at the Shredders is an issue that awaits her down the line (and she’s the one who wants to be here—at least “for a while”). For now there’s the LTD. John wishes his father would stop doing this kind of thing. Now and then from the county attorney’s office these kinds of vehicles come their way. A car that’s been victimized. Usually it’s some unsalvageable wreck left over from a getaway crash or else an abandoned hulk of untold secrets winched from a lake. Nothing this gruesome before. The Senior is always happy to take the vehicle off the county’s hands. It’s the type of favor he gladly does. The Shredders tow it, strip it, take out the battery, tires, and exhaust system, haul the worthless stuff to the landfill and pay the fee themselves, and for all their trouble they get about 70 dollars worth of iron hunk and one chit of good will redeemable at the county attorney’s. The LTD, should go pell-mell headfirst into the shredder, forget about stripping off the tires, forget about making a few cents on the radiator, engine, and exhaust. Throw it all in and get rid of it. The smell has already trashed the car. John’s opinion. Not the Senior’s, clearly. According to him, all it needs is to be cleaned, deodorized, and upholstered.